Are you one of them who are not accustomed to the new Windows 8’s Metro start screen? Here is a perfect solution for users who can get back the old Start Menu as well as the Start button. “Start Menu 8” is a freeware application which is developed particularly for Windows 8, who work and habituated with Windows Start Menu all the time. 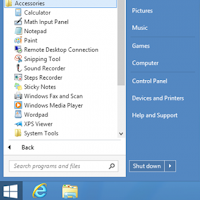 This innovative tool serves as the best start menu replacement for Windows 8. Unfortunately, the critical response we are getting from most of Windows 8 users made some of the developers think to design an easy application which could emulate the style and function of the classic Windows 7 start menu. With Start Menu 8, you can easily switch between Metro and Desktop interface and get faster access to all necessary programs and files you need. This application is highly customizable, easy to use and it is absolutely free. The latest version 1.1.0 has added few enhancements to the application such as user manual, the option to press Win key to open Metro, MetroApp and Settings interface in the right pane of the Start Menu, the option to display the number of recently used programs, Start menu icons, and fixed several bugs. The new version has also optimized the style and response of Start menu button. The look and feel of Start Menu 8 copies the classic Windows 7 start menu, both in style and function, but comes with a few tweaks and enhancements. When you press the “Windows” key, it will open the menu and display a list of folder shortcuts, a search bar, and a list of program folders for painless access to all your applications. You can customize individual components of the menu like creating a shortcut to open a new window or a popup, etc. 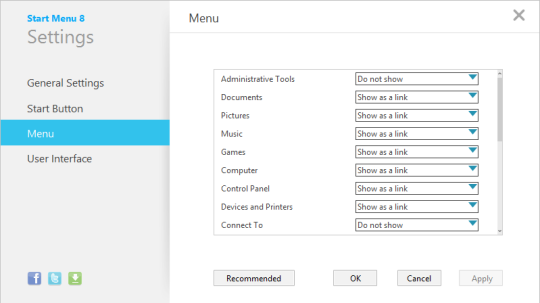 You can still access the default Start Screen of Windows 8 without uninstalling the ‘Start Menu 8’ application. Just press “Alt+X” or set a custom hotkey instead to access. Start Menu 8, with its customization level, is different from other notable competing apps in the market which enhance the Windows 8 experience, but falls short in showing apps that are downloaded from the Windows store. The user can only access them from the Modern UI Start screen. Finally, for Windows 8 users, if you are accustomed to the Windows 7 Start Menu, this application is download worthy that features both basic needs, tweaks and enhancements, and offers imperative customization levels to improve Windows 8 experience. Download Start Menu 8 from its official website for free.